There’s nothing like a Devon blue, and for the Finally Farm team they came in abundance during Junior Weekend, held May 24-27 in Devon, Pennsylvania. Maggie Hill, competing at her first Devon Horse Show, captured the Large Junior, 15 and under, championship. In the weeks leading up to the show, trainer Liza Boyd offered Maggie some words of wisdom that carried through. The Sunday before Devon, in a schooling ring in Tryon, Liza pulled Maggie aside and told her, “I believe in you and know you can do well at Devon but go there and be happy. Be happy just getting a ribbon of any color. Some people take a long time to get a Devon blue. I think that took the pressure off, and she arrived relaxed,” said Liza. 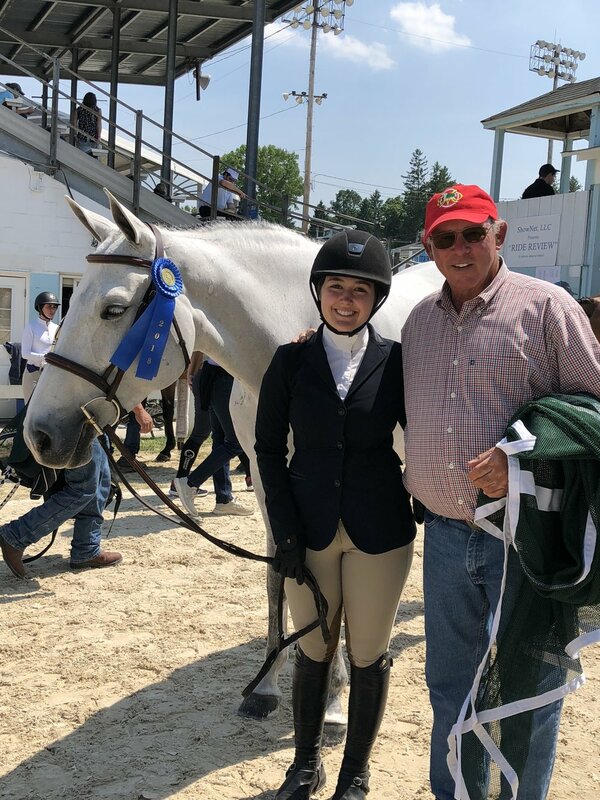 Maggie began her Devon debut aboard Charmeur and received her first ribbon on the first day with a fourth in a section of the Dover Saddlery/USEF Medal. That confidence boost set the stage. As the Junior Hunters began on Friday, Liza could see that Maggie was riding confidently. Maggie returned the second day and was on fire. She placed second aboard O’Ryan and won both over fences classes on Cassanto. “Maggie got better and better each round and more relaxed,” said Liza. “By the last round I was thinking I’d never seen her so relaxed and calm. It was due to her hard work and dedication as well as her supportive parents and these two great horses. Liza also believes her training partnership with her father, Jack Towell, makes a huge difference in the preparation and the results their riders achieve. Liza and Jack followed that same routine with Abbie and Libbie Gordons’s ponies, Farmore State Of The Art, Small Wonder and Pacific Blue. Liza rode Farmore State Of The Art in the schooling area and focused on what might help Abbie navigate the ring, keeping him straight and moving forward. Their teamwork paid off, as Abbie and her Small Pony won an over fences class on the first day and placed second in the stake class. Libbie also picked up ribbons aboard Pacific Blue and Small Wonder in the Large Pony section. Abbie also won the Small Pony Hunt Teams with her teammates, riding to the “Top Gun” theme. For Abbie, Devon was bittersweet. She’s on the verge of outgrowing Farmore State Of The Art and not renewing the lease, so Liza and Jack spent time talking to her and lightening the mood during the course of the show. Libbie is also transitioning after Devon and moving out of the ponies, so her ribbons were meaningful, as well. “She just leased a Children’s Jumper named Athletic Lady. She’s a really cute mare, and we’re looking forward to a fun summer with her and then Shamrock in the Junior Hunters,” said Liza. Elly Ficca was on the standby list for Devon and only found out she’d be going the night before the horses left for the show. But she made the most of her opportunity with Cleopatra’s Smile, winning the first over fences class, placing second in the stake and earning the reserve championship in the Small Junior, 16-17, section. Speaking of hard work, Liza also noted that such a successful Devon doesn’t come without dedication. “We have a wonderful group of kids. They show and practice more than most,” she said. “All of these kids went to Tryon and lessoned beforehand. They’re extremely dedicated, as are they’re parents. Posted on May 31, 2018 by Tricia Booker.